Are Ethics and Efficiency Locked in Antithesis? We argue that ethics and efficiency are not locked in antitheses; that is, we argue that ethics and efficiency are not related in a fixed way. To do this we first argue that we have obligations to other human beings, animals and the environment. These obligations can be grounded in a number of moral theories that share a common normative outcome. We then explicate two conceptions of how ethics and efficiency may and actually do coexist in the food market. 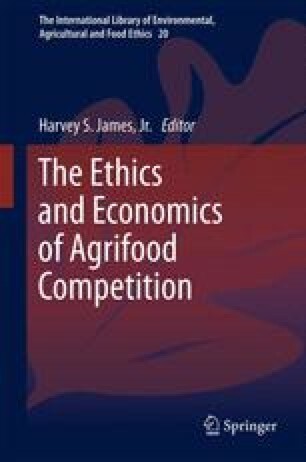 We argue that our moral obligations must be included in analyses of the behavior and performance of agri-food markets and that these duties do not lead to inefficiency, per se. At a minimum, they represent a set of constraints on production to which efficient producers adhere. We also note that there are markets for ethically produced foods, ranging from Fair Trade commodities to organic vegetables, wherein producers and consumers discover the prices of ethical attributes in efficient exchange. However, the existence of these markets for ethically produced products does not exhaust our moral obligations. If we have such duties, they must be institutionalized throughout the sector.